Stowe is the quintessential Vermont village, and mid-October is a wonderful time to visit. 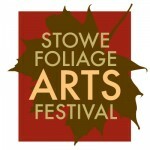 Peak foliage, crisp cool days, and the Stowe Foliage Arts Festival. 200 Art and Craft Exhibitors mean plenty of shopping options for all tastes and styles - jewelry, home goods, decor, furniture, clothing, gifts, food, spirits, maple products, and so much more!